If you’re looking for something fun and exciting this summer, look no further than Camp Sequassen. 2019 marks the 92nd year that we’ve been delivering strong Scout programs to troops. Your time at camp will be a very personal experience of learning, having fun and growing in mind, body and spirit in the presence of hundreds of your fellow Scouts. Whether it’s because of the camp’s staff, the camp’s lore, the camp’s surrounding natural beauty or the quality of the camp’s programs, a week at Camp Sequassen will make an impression on you that will last a lifetime. Please note that, while you may enter campsite preferences, site selection cannot be guaranteed. A unit must commit to attending with a minimum of 10 Scouts to reserve an individual site. Units that plan to bring fewer than 10 Scouts may still register and indicate site preference but will not be assigned a site until other units’ camper numbers can be determined. New unit registrations require a $200 non-refundable unit deposit. The $200 fee should be applied as a credit to the unit’s individual Scout/Scouter registrations when they are entered. March 31, 2019 is the deadline for entry of Scout rosters. At that time, a unit will be responsible for a minimum payment of $50 per registered Scout. To be eligible for the Early Bird discount, full Scout fee must be received in the Council office by the April 15 deadline. Fees paid after April 15 are at the regular rate and the balance is due no later than the Troop’s pre-camp meeting date, approximately three and a half weeks prior to the start of the appropriate camp session (check the Leader’s Guide for the pre-camp meeting schedule). Online payments may be made by credit card or electronic check. If your unit prefers to submit payment(s) to the Council office, please plan to do so in advance of entering your roster online. Fees submitted to the Council office will be entered as a unit summer camp registration credit that you will be able to draw against as you enter your Scouts and Scouters online. Roster entries entered without payment will be held in your “cart” until payment by credit card or electronic check is authorized. Need a summer job? Join Camp Staff! Click here to apply for Camp Staff! If you’re interested in another week, contact Camp Registrar, Carolyn, (203) 951-0237 or ccruson@bsamail.org to sign up! This high adventure event is for young men and women, 14-20 years old. The Aquatics, Climbing and Shooting Action Centers offer a wide variety of activities and challenges. Check out SCUBA diving, snorkeling, tubing on the Farmington River, climbing, high wire course, archery, rifle/shotgun shooting, and more! There’s event time to get in a few merit badges if you like. 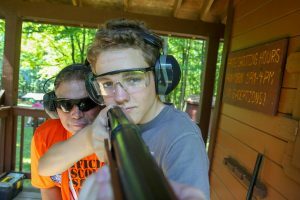 Select Discover Adventure as an option when you register for Scouts BSA resident camp either with your troop or come to camp for a week with a buddy or on your own. Don’t forget to check out our special multi-week discounts! Participants at Summer Camp are required to submit Parts A, B, and C of the BSA Annual Health and Medical Record, valid through the end date of the appropriate camp session. This applies to both youth and adult attendees. Youth campers also need a completed Connecticut Yankee Council Addendum. Please note: SCUBA participation requires an additional health form available below. NOTE: SCUBA participants must supply the included RSTC Medical Statement, signed by their physician,in addition to the regular camp health form. 2019 Staff Application Form – online application (link above) preferred!